The Honda Brio has been reportedly discontinued due to very low demand for it in the market. Small cars still command the of majority sales in the Indian market for any car maker. 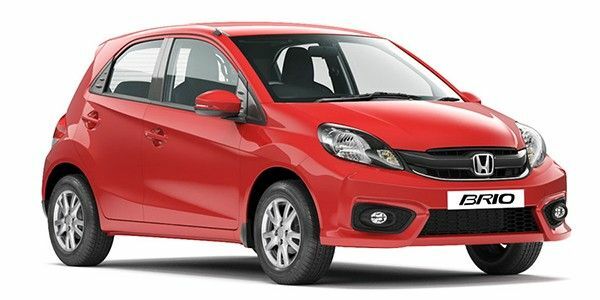 With that in mind, Honda entered the class with the launch of the Brio in 2011. The Brio was given a lst-gen Amaze-inspired facelift in 2016 to keep up with the competition.On the inside, the two-tone dashboard was replaced by an all-black one.Like it goes with facelifts, the Brio continued to sport the same 1.2-litre i-VTEC mill that produces 88PS and 109Nm. This unit was paired to either a 5-speed manual transmission or a 5-speed torque converter automatic transmission. Honda Brio prices start at Rs. 4.73 lakh for petrol and goes upto Rs. 6.82 lakh. Honda Brio is available in 5 variants and 4 colours. The claimed ARAI mileage for the Honda Brio petrol is 18 kmpl. The Honda Brio has been discontinued, after a prolonged period of very low sales numbers. It was the oldest car in the Japanese carmaker’s lineup. It did receive an update in 2016 that included an all-new bumper and grille combo like the one seen on the Amaze sedan. At the rear, it had a stubby spoiler and LED lights with updated graphics. The nippy little hatchback was powered by a reliable 1.2-litre i-VTEC petrol motor. The drab-looking dashboard of the older version had been swapped for a much better-looking setup that is in line with the Amaze’s cabin. The quality and fit-finish, however, were a notch below the 2018 Maruti Suzuki Swift and the Hyundai Grand i10. The all-black theme with dull silver and carbon-fibre textured accents added a hint of sportiness to the overall package. The ergonomics were spot on and everything from the new digital air-conditioning controls to the knobs and switches for the audio system was well within reach. Other features included a new instrument cluster, power windows all around, seat-height adjust and tilt-steering. The Honda Brio was powered by a 1.2-litre, 4-cylinder i-VTEC petrol engine which produces 88PS of power and 109Nm of torque. There were two transmission options to choose from - a 5-speed manual or an old-school 5-speed torque converter. If it’s peppy performance you were after, you'd stick to the manual ‘box. Claimed fuel efficiency stood at 16.5kmpl for the auto and 18.5kmpl for the manual. Maruti WagonR: Maruti’s tallboy is as practical as little hatches get. While it doesn’t have a diesel engine to offer, the petrol engine is known to be peppy, refined and economical. Like the Tiago, the WagonR offers the convenience of an AMT paired with its petrol engine. If you are in the market for a hatchback, there are plenty of options that you can choose from. While the Honda Brio may not have been everyone’s preferred choice, it did feature a unique design that none of the other cars can even dare pulling off. Hence, if you did need something that stands out from regular hatchbacks while offering peppy performance, you couldn't go wrong with the Honda Brio coupled with the high-revving i-VTEC petrol motor.